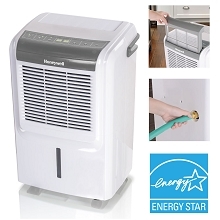 The Keystone Energy Star 50-pint dehumidifier removes up to 50 pints of moisture from the air per day in a room up to 3000 square feet. Features include electronic controls with LED display, a 24-hour timer, a transparent water level indicator and a full bucket alert with automatic shutoff. Continuous draining option is available using a low-level drain and a standard garden hose (garden hose not included). 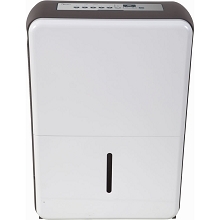 It also has a removable, easy-cleaning dust filter with a clean-filter alert. The auto-restart saves your settings during a power outage and the rolling casters make the unit easy to move to another location. 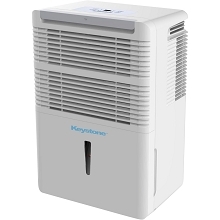 The Keystone 30-pint dehumidifier removes up to 30 pints of moisture from the air per day in a room up to 1500 square feet. Features include electronic controls with LED display, a 24-hour timer, a transparent water level indicator and a full bucket alert with automatic shutoff. Continuous draining option is available using a low-level drain and a standard garden hose (garden hose not included). It also has a removable, easy-cleaning dust filter with a clean-filter alert. The auto-restart saves your settings during a power outage and the rolling casters make the unit easy to move to another location. 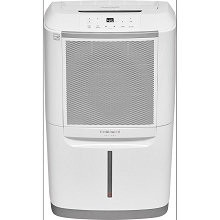 The Frigidaire 70-pint dehumidifier with built-in pump protects your home from mold and mildew caused by excess moisture. 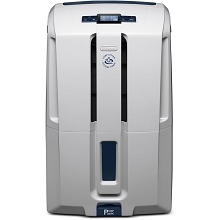 It also helps eliminate bacteria in the air that can make breathing difficult. 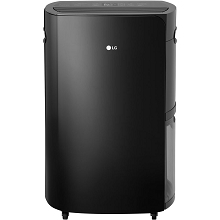 The built-in pump option allows the unit to continuously discharge moisture in an upward direction, either into a sink or out of a window, saving you time from manually emptying the water bucket. 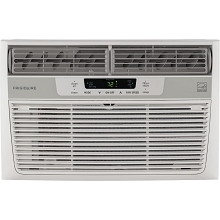 Ready-Select electronic controls include a digital humidity readout, 24-hour on/off timer and control lock. 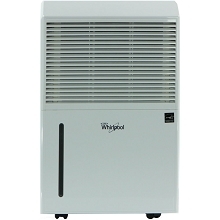 Effortless Humidity Control allows you to control the exact percentage of humidity in your room. 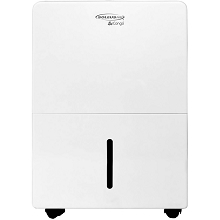 The SpaceWise portable design includes a top handle, integrated side handles and caster wheels making it easy to move your unit from room to room. 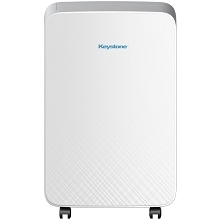 The Keystone 70-pint dehumidifier removes up to 70 pints of moisture from the air per day in a room up to 4500 square feet. Features include electronic controls with LED display, a 24-hour timer, a transparent water level indicator and a full bucket alert with automatic shutoff. 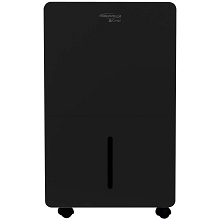 Continuous draining option is available using a low-level drain and a standard garden hose (garden hose not included). 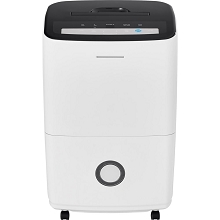 It also has a removable, easy-cleaning dust filter with a clean-filter alert. The auto-restart saves your settings during a power outage and the rolling casters make the unit easy to move to another location. 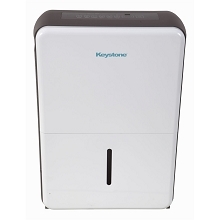 The Keystone 70-pint dehumidifier removes up to 70 pints of moisture from the air per day in a room up to 4500 square feet. 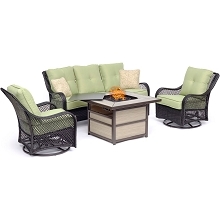 Features include sleek new body design, electronic controls with LED display, a 24-hour timer, a transparent water level indicator, and a full bucket alert with automatic shutoff. Continuous draining option is available using a low-level drain and a standard garden hose (garden hose not included). 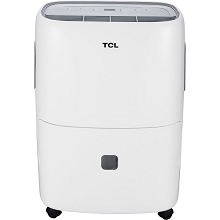 It also has a removable, easy-cleaning dust filter with a clean-filter alert. The auto-restart saves your settings during a power outage and the omni-directional caster wheels make the unit easy to move to another location. 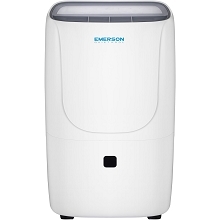 The Keystone 50-pint dehumidifier removes up to 50 pints of moisture from the air per day in a room up to 3000 square feet. 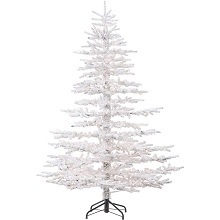 Features include sleek new body design, electronic controls with LED display, a 24-hour timer, a transparent water level indicator, and a full bucket alert with automatic shutoff. Continuous draining option is available using a low-level drain and a standard garden hose (garden hose not included). 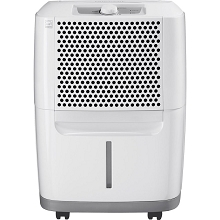 It also has a removable, easy-cleaning dust filter with a clean-filter alert. The auto-restart saves your settings during a power outage and the omni-directional caster wheels make the unit easy to move to another location. 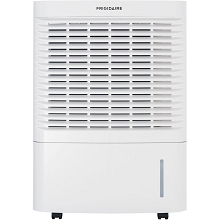 The Frigidaire 50-pint dehumidifier protects your home from mold and mildew caused by excess moisture. 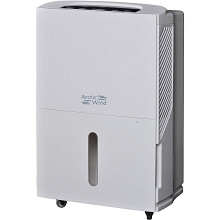 It also helps eliminate bacteria in the air that can make breathing difficult. Frigidaire’s 50 pints-per-day dehumidifier is capable of continuous operation when the unit is located near a suitable low-level drain. 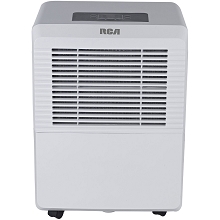 Ready-Select electronic controls include a digital humidity readout, 24-hour on/off timer and control lock. 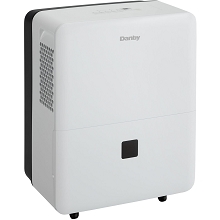 Effortless Humidity Control allows you to control the exact percentage of humidity in your room. 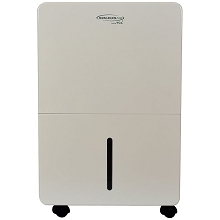 The SpaceWise portable design includes a top handle, integrated side handles and caster wheels making it easy to move your unit from room to room. 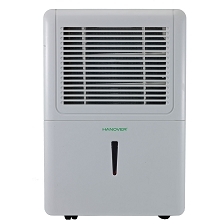 The Hanover 50-pint dehumidifier removes up to 50 pints of moisture from the air per day in a room up to 3000 square feet. Features include electronic controls with LED display, a 24-hour timer, a transparent water level indicator, and a full bucket alert with automatic shutoff. Continuous draining option is available using a standard garden hose (hose not included) and a low-level drain. 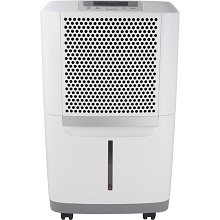 It also has a removable, easy-cleaning dust filter with a clean-filter alert. The auto-restart saves your settings during a power outage and the omni-directional caster wheels make the unit easy to move to another location. 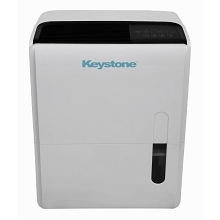 The Keystone 70-pint dehumidifier features a built-in worry-free pump that allows the unit to continuously discharge water upward to drain out a basement window or into a sink removing up to 70 pints of moisture from the air per day in a room up to 4500 square feet. Features include electronic controls with LED display, a 24-hour timer, a transparent water level indicator, and a full bucket alert with automatic shutoff. 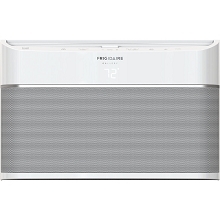 It also has a removable, easy-cleaning dust filter with a clean-filter alert. The auto-restart saves your settings during a power outage and the omni-directional caster wheels make the unit easy to move to another location. 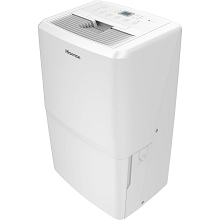 The Keystone 95-pint dehumidifier features a built-in worry-free pump that allows the unit to continuously discharge water upward to drain out a basement window or into a sink removing up to 95 pints of moisture from the air per day in a room up to 6,000 square feet. Features include electronic controls with LED display, a 24-hour timer, a transparent water level indicator, and a full bucket alert with automatic shutoff. 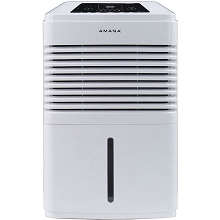 It also has a removable, easy-cleaning dust filter with a clean-filter alert. The auto-restart saves your settings during a power outage and the omni-directional caster wheels make the unit easy to move to another location. 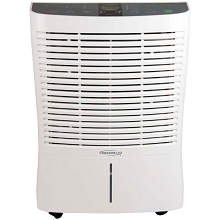 The Hanover 70-pint dehumidifier removes up to 70 pints of moisture from the air per day in a room up to 4500 square feet. Features include electronic controls with LED display, a 24-hour timer, a transparent water level indicator, and a full bucket alert with automatic shutoff. Continuous draining option is available using a standard garden hose (hose not included) and a low-level drain. 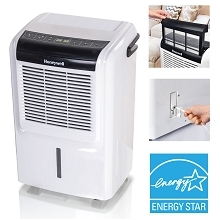 It also has a removable, easy-cleaning dust filter with a clean-filter alert. The auto-restart saves your settings during a power outage and the omni-directional caster wheels make the unit easy to move to another location. 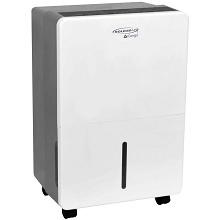 The SoleusAir 95-pint portable dehumidifier with an internal pump for continuous upward drainage is a powerful, reliable and convenient way to protect your home from mold and mildew caused by excess moisture. 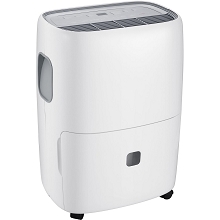 MyHome mode, a patent-pending technology, takes the guesswork out of using a dehumidifier. 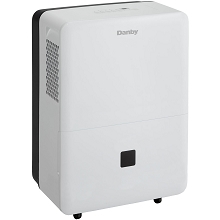 Simply choose from the basement, living space or sleeping space settings for the perfect humidity level wherever you place the unit. Of course, if there is a custom humidity level that you prefer, it can always be manually set using the digital humidistat. 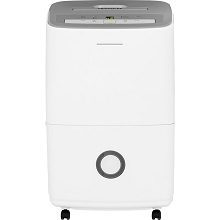 Caster wheels make this dehumidifier easy to roll from room-to-room while the washable and reusable filter keep maintenance convenient. Stay comfortable and keep moisture at a minimum with a SoleusAir portable dehumidifier.